Apple Inc needs to improve its Chinese market strategy to match its surging growth in the country, industry experts told China Daily. According to its recent quarterly report, the US-based company's third-quarter sales revenue in China surged sixfold year-on-year to $3.8 billion. In an earnings call on Tuesday in the United States, Apple's Chief Operating Officer Tim Cook said the company had huge growth in China for the past three quarters with total revenue from the country reaching $8.8 billion. Cook said China was a main region in the company's total quarterly revenue, which increased 82 percent to $28.6 billion year-on-year. Sales momentum from iPhones in the Asia-Pacific region was particularly robust, quadrupling year-over-year. Emerging markets including China, Brazil, Mexico and the Middle East were a big component of iPhone sales this quarter, according to Credit Suisse Securities (USA) LLC. However, when Cook said he believes that the company is just "scratching the surface" of the Chinese market, domestic analysts warned the company to pay more attention to its sales channels and customer service. "Looking at Apple's long-term development in China, I have doubts about its sales sustainability," said Lu Libin, an analyst with domestic IT research company Analysys International. Lu mentioned that a scarcity of official retail outlets and limited support from telecom carriers will narrow Apple's official sales in China, leaving space for scalpers and gray market sales. "In the past, the US and European markets were Apple's priority. 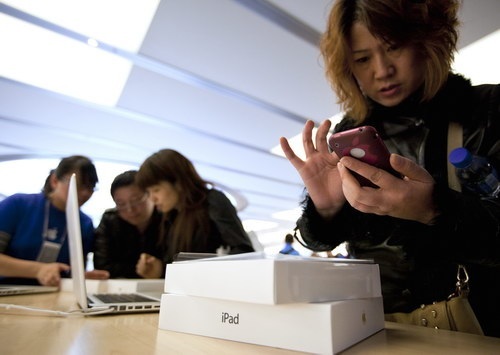 The Chinese market received Apple's newest products later than other countries," Lu said. The company's iPhone 3GS arrived in the Chinese market almost two years later than in the US, while the popular handset iPhone 4 had a nine-month delay. The release delay provided opportunities for scalpers. During the delay, an iPhone 4 could be sold for around 12,000 yuan ($1,858) in China's gray market without any warranty. Scalpers can be found hawking their wares outside Apple's Sanlitun store in Beijing. Apple's iPhones received a 7 percent market share in the first quarter of this year in China's smartphone market, which totaled 19 million units in sales. "The iPhone 3GS had a poor sales performance in China before," Lu said. He said the iPhones are targeting the high-end market in China rather than the low- and middle-end markets. The price of an iPhone 4 is 4999 yuan without a contract. The average salary in Shanghai was around 5,300 yuan a month last year. Customers with broken products must make an online appointment and wait about a week to meet with service technicians because of the small number of official Apple stores. Although Apple has labeled China as "key market", it has only four stores in the country, which accounts for one-tenth of the company's sales revenue. With 31 provinces, municipalities and autonomous regions on the Chinese mainland and a population of 1.3 billion, four times that of the US, there are only four Apple stores, while the United States has 236. "In the long run, Apple can likely increase its market share since it is gaining sales momentum by investing more resources into China, which it had not been doing previously. However, I think the company needs to implement a more solid strategy," said Kitty Fok, vice-president of the research company IDC Asia-Pacific.